Wednesday, 07 April 2010 08:47That President Musa Umaru Yar’Adua has been away from public view since the 23rd of November 2009 is no longer news. That his absence and the subsequent power play and shenanigans almost led the country to a state of anarchy is also not a news story, what is however bizarre is the tragic-comedy we are being subjected to by handlers of the President, the more we try to move forward as a country, putting the Yar’Adua drama behind us, the more forces behind the presidents disappearance are also determined to keep the Yar’Adua memory on our table. It is done in such a way that they arrogantly want to tell us we can not move forward as a people without the President. 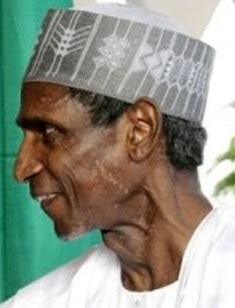 If the President is sick we should be sick, if he coughs we must cough, how best can we describe the macabre dance?Check out the rough time-line, 23rd November 2009 Yar’Adua was reported to have walked on to the Presidential Jet unassisted and jetted out to Saudi Arabia for a “routine medical check up”. The country was subjected to series of debate as to how “routine” the presidential check up was. The presidency spent weeks refuting speculations that he was smuggled out of Nigeria, then as tensions rose with online bloggers digging, the presidency was forced on the 26th of November 2009 to release a statement that he had pericarditis – inflammation of the heart lining, when it became obvious that the restlessness of a minority calling on the president to step down was becoming justified, a court case was filed on the 23rd December urging him to step down, followed suit by two more court cases by January 5, and then several protest in four continents followed, on the eve of a mass protest in Abuja Nigerian capital a man purportedly President Yar’Adua “granted few minutes interview with the BBC and at a time his country was being put on a terrorist list all Mr Yar’Adua could think of was to wish the Nigerian football team “good luck” in the African cup of Nations football tournament. Under pressure from Nigerians and with its own survival in mind a docile national assembly circumvented the constitution and rather than impeach Yar’Adua went for a political compromise by invoking a forgotten “principle of necessity” to make Vice President Goodluck Jonathan acting president, Nigerians grudgingly accepted the faith accomplice so as to in the usual mantra “move the nation forward” but as determined as Nigerians are to move forward, those who appear to have hijacked Yar’Adua and making political advantage of his incapacitation are for ever determined to place Yar’Adua’s interest above the interest of 150 million Nigerians. It was first the Nollywood style drama of bringing what appears to be Yar’Adua into Nigeria in the wee of the night without the acting Presidents having a clue that a military operation was taking place, then news feeds about the president drinking the traditional tea with a long lost cousin who later disappeared after his Al-Jazera interview, then before the tea got cold, we were entertained with another news feed of the president taking walks around the beautiful gardens of Aso Villa and having syndicating whispers with birds and nature, all this while is closest next door neighbour who happens to be his Vice President even with powerful binoculars could not set eyes on Yar’Adua and then we were told the president was meant to resume work and shame his enemies. When the usurpers ran out of lies and scripts, a nation not lacking in drama had to go for another round of expectations with Yar’Adua handlers telling the world he would appear at the Abuja Central mosque, Nigerians took it upon themselves to run live updates at the mosque and the closest of what they got was a Yar’Adua poster close to the entrance of the mosque, as the appearance failed to materialise, Islamic clerics where horridly arraigned to brief doubting Thomas’s that Yar’Adua was fit and healthy as he managed to raise his hands and that was it, our president is fit as a result of a medical certification of a local imam, whose diagnosis was the raise of a hand. When you think the Yar’Adua handlers had ran out of script and that we would be allowed to face the many daunting challenges facing a sleeping giant of a Nation then from the Nollywwod script came a bombshell. 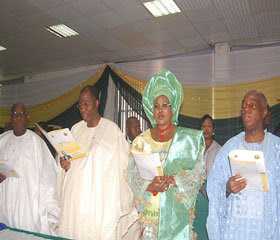 Christian leaders had been arraigned to meet Yar’Adua and in case a doubting nation did not believe the raising of a hand story of a local Islamic cleric their was the need to enroll the service of respected men of God and who else than Bishop David Oyedepo who is described as the “flamboyant pastor and jet-set cleric of the prosperity winners chapel, accompanied by Reverend Emmanuel Kure, and Archbishop Onaiyekan and by the time the men of God left Yar’Adua the medical report they could come with was President Musa Umoru Yar’Adua being hail and healthy and managing to “grunt Amen” and then a denial by senior pastors in Oyedepo’s winners chapel, swearing to God that Bishop Oyedepo was busy tendering to his disciples in Ota during the time of the said Yar’Adua visit and that the on line media Sharareporters fabricated the story. Before we could say Sahara our man of God was seen less than 24 hours after the Yar’Adua visit in the company of Former President Olusegun Obasanjo, Ogun State governor Gbenga Daniel and the many Oluwos of Egba telling Nigerians to mind their business that his visit to Yar’Adua was a very private visit and like every soap opera in Nigeria, a visit by cleric to a President who refuse to see his deputy or any member of his ruling party is in the words of the Bishop “private” and then the denial swept under the carpet. We can not touch the anointed men of God but pretty soon God “grunt” will become a roar and then questions will be asked, what a sad ending to a badly written script, do we have to be reduced to this comedy? Why cant Yar’Adua’s handlers get it and acknowledge that the power game is up, let the man rest, recover peacefully and if it is Allah’s wish that he his in last days give him the grace to reconcile with his creator and our nation the grace reconcile with the task of “moving forward” it is time to save Yar’Adua from Yar’Adua so that Nigerians can free Nigeria from some Nigerians.